Oh how sad.... Hope Bobby returns.... I can only imagine how much you all miss him..
Oh no! Come home, Bobby! Don't give up hope--we had a cat come home about 10 days after she went missing. Oh my I sure hope that he's okay, what a sweet and adorable part of your family to be lost. I know though we have had outdoor groundskeeper cats that have gone missing, and it's the wild critters we worry about. Sometimes, it is true that they being so friendly can adapt around other distant farms out here and those folks may keep them, that's another thought. We only have on kitty cat left and she is not allowed to go outdoors. My dogs every time we go at night late in the dark I have taught them this and it keeps my Misty close to me. Their could be bad guys out here. She seems to understand that. Good luck for Bobby I hope he gets back home. I hope Bobby shows up again - one of our cats disappeared for a month, but did return, skinny and dirty. Hoping you find him on the porch waiting for you one day soon. Oh no. I am so sorry! The not knowing is so hard. Our cat disappeared for four days in an ice storm. But one night he came meowing at the door right at his dinner time. After that, he never wanted to go out again. I feel bad for the boys. I said a prayer. Yes, people in our church have prayer for cats. Please let me know when you find anything out. I sure hope Bobby comes back. This past summer, we lost Beorn, Black Momma, and Calico Lady, always at night. We try to keep the cats inside at night, but the barn cats can't be kept inside. With all the electronic detection devices focused on the Jeep trail and the two minor access points in the forest, we are safe enough from people but the denizens of the forest can get in close to the house without any difficulty. What a special boy he is. Hopefully he's just out 'catting' around and will be home soon. Please keep us posted. Oh no!! Bobby is so precious. I hope he comes home soon. 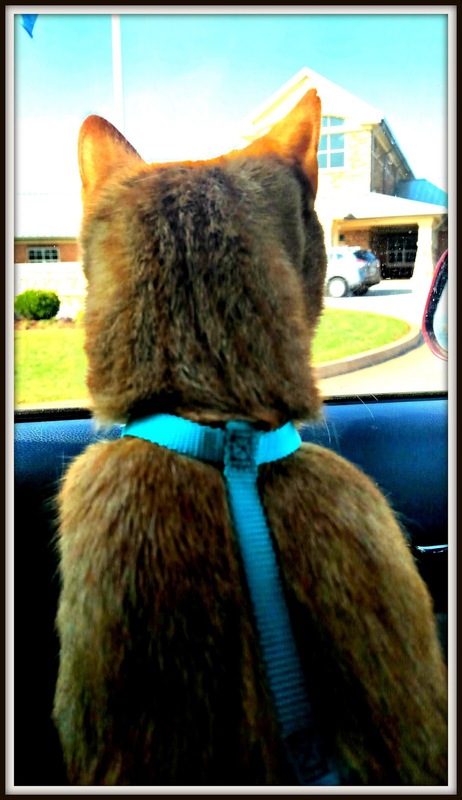 How cute that he enjoys waiting in the car for the boys--what personality! Sending positive thoughts. Whish you all the best and hope for a safe return. Oh dear! I hope he comes home soon. I hope Bobby turns up. We had a coyote hunting our cat, as we watched. I didn't realize the cat was out. She went up a tree and didn't come down for an hour! I hope Bobby turns up. Coyotes can't climb trees, at least. That is sad. Your kids will miss Bobby!